Join us for weekly art classes at Quiggly's Clayhouse! Classes Start August 29th! 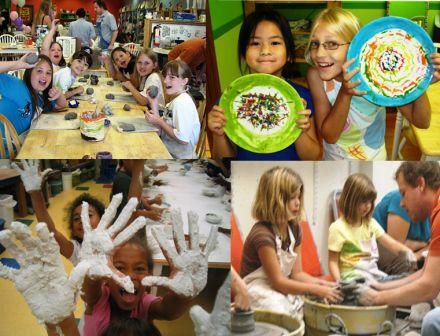 Class projects include drawing and designing, Canvas Painting, glazing pottery, pottery wheel instruction, glass fusing, clay sculpting and mosaics! Quiggly's Art4Kids Class is ideal for kids with little or no experience using multiple artistic mediums. More than just art education, Quiggly's offers the perfect entertainment venue for children to begin their week with fun, artistic and imaginative adventures! Our projects are designed to expand your child's appreciation for creative learning and artistic expression. Developing skills to produce both 2-D and 3-D art in the form of drawings, paintings, ceramics, mosaics, glass fusion and more requires practice in designing, planning and executing the creative process. Register for one class at at time: $25 +tax. (This is ideal for children wishing to attend only certain days. Register for 4 or more classes at a time and pay only $20+tax each class. (This discount also applied to siblings).